Boost Mobile Wallet makes it easy to connect with your money and friends. 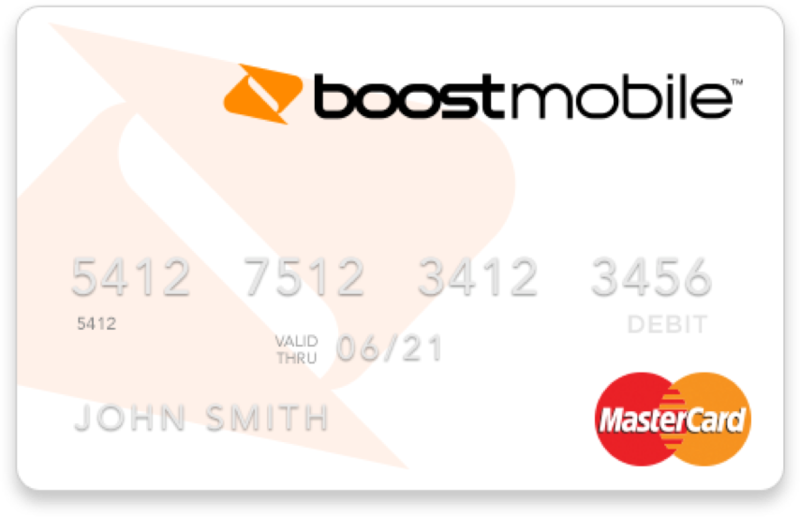 The Boost Mobile Wallet Prepaid Mastercard®, together with the app, is the convenient way to handle your finances and pay for purchases without carrying anything more than your phone and card. Discover local deals & reviews. Card funds will be FDIC insured provided the card is registered to the name of the primary cardholder. Approval is contingent upon passing this mandatory identification confirmation. Swipe, Sign and Go with Boost Mastercard. Direct deposit recurring payments (like your paycheck, government benefits and/or tax refund) and load cash at more than 150,000 convenient Mastercard® rePower and Visa ReadyLink locations. Pay online, in stores, at the pump—everywhere debit Mastercard is accepted (which is pretty much everywhere); plus, get cash at more than 25,000 surcharge-free MoneyPass® ATMs. Transform your phone into a new way to money. Know what's available to spend before you spend it. Easily split the bill with friends after a night out or send them a few bucks for morning coffee. Re-Boost your phone or replenish a family member's domestic or international wireless account. Deposit checks in minutes. Boom. Explore local deals and reviews for popular places to go, and try them out with your crew. More money in your pocket with thousands of deals brought to you by Groupon. Buy and send eGift cards from top brands to the ones you love "just because." Check in, post pics and tag friends so they don't have to wonder Where You At? The Boost Mobile Wallet Prepaid Mastercard® is issued by Sunrise Banks N.A., Member FDIC, pursuant to a license from Mastercard International Incorporated. Mastercard is a registered trademark, and the circles design is a trademark of Mastercard International Incorporated. Use of this card constitutes acceptance of the terms and conditions stated in the Cardholder Agreement. * This feature is not a product of Sunrise Banks and is provided by a third-party partner.